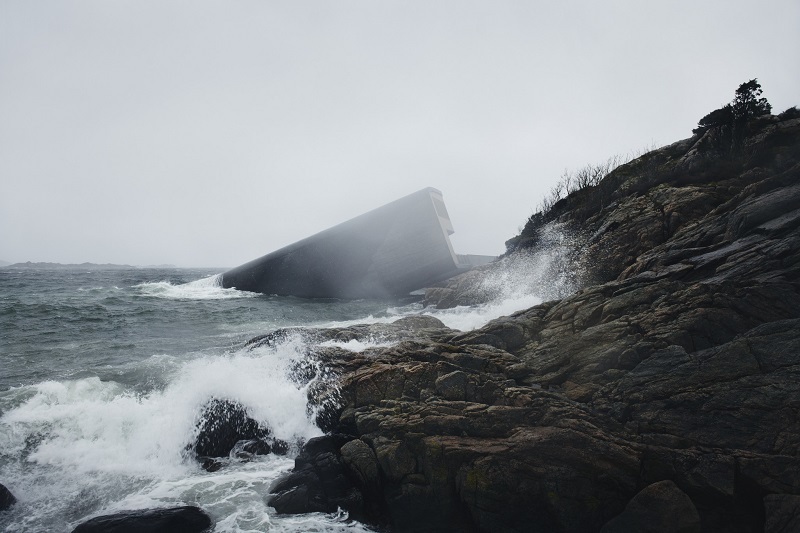 Under, a 3,230 sq ft semi-submerged restaurant in Lindesnes, is also a marine biology station. A semi-submerged restaurant in Lindesnes on the coast of southern Norway is making waves for being the first underwater eatery in Europe. 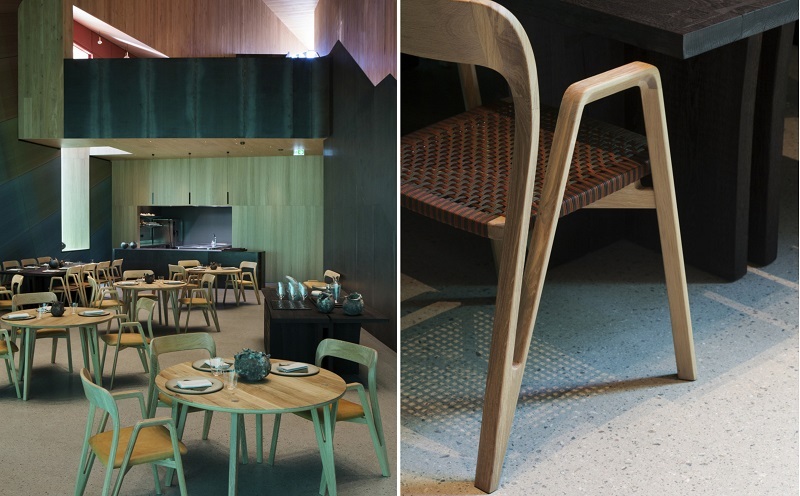 Opened yesterday, diners will be able to take in the sights of the sea while enjoying dishes made from locally sourced produce and sustainable seafood. Called Under, the 34-metre-long concrete structure will also encourage important marine research. Breaking the surface of the water to rest on the seabed five metres below, this brainchild of local hoteliers Stig and Gaute Uboastad was designed by Oslo-based architects Snøhetta, an international firm best known for projects such as the Norwegian National Opera and Ballet, the National September 11 Memorial & Museum at the World Trade Centre site in New York as well as futuristic Svart, the world’s first energy positive hotel situated just above the Arctic Circle. 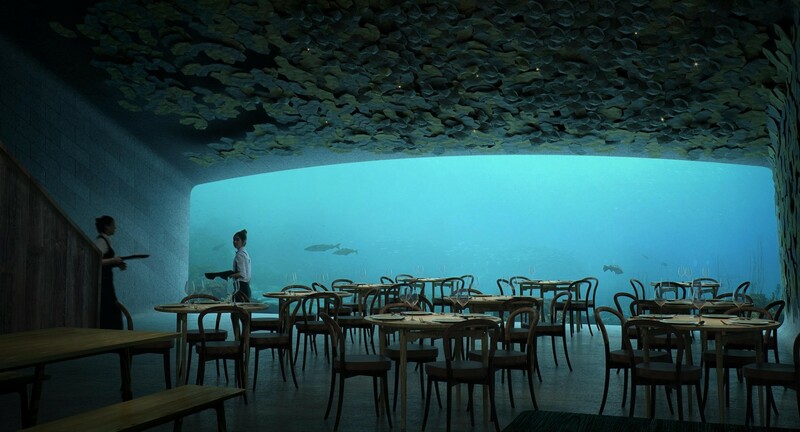 Housed in half a metre-thick concrete to withstand rugged sea conditions, the £6m (RM30 mil) restaurant is designed to integrate into its environment, doubling as an artificial reef that welcomes limpets and kelp to inhabit it. The flourishing marine life surrounding the building will allow research teams to study the site’s unique aquatic biodiversity. Guests are immediately ushered into an oasis of calm from the intense weather conditions enveloping the area as they take in the oak-clad foyer and rich interior design that functions as a metaphor for the journey from land to the sea. The gradient of bespoke, fabric-covered acoustic panels on the ceiling mimics the colours of a sunset fading over the ocean. A champagne bar marks the transition between the shoreline and the ocean while the dining room, kitted out with Hamran furniture that seat 40 people in total, is fitted with a 11 x 4-metre panoramic acrylic window offering a view of the seabed as it changes throughout the season. Food-wise, Under’s kitchen will be helmed by Danish chef Nicolai Ellitsgaard from Måltid, a gourmet restaurant in Kristiansand, Norway. 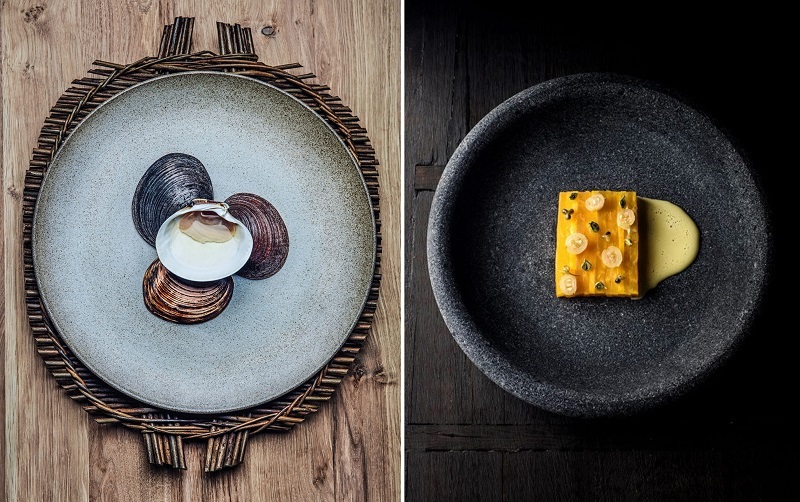 The menu, curated with input from the station’s marine biologists, is kept under wraps to lend an element of surprise but it will centre on dishes sourced from surrounding waters, farms and wildlife. The restaurant is almost fully booked until September, although some spaces are still available over summer. Immersion Menu starts from NOK 2250 (RM1,078); wine-pairing costs an additional NOK 1450 (RM700). Book a table here.